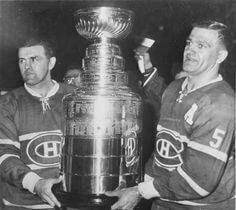 The 1959 Stanley Cup Final was contested by the defending champion Montreal Canadiens and the Toronto Maple Leafs. Montreal was making its ninth consecutive appearance in the Final series. It was Toronto’s first appearance since 1951. The Canadiens would win the series four games to one to win their fourth-straight Cup victory. The 1958 Stanley Cup Final NHL championship series was contested by the defending champion Montreal Canadiens and the Boston Bruins in a rematch of the 1957 Final. The Canadiens would win the series 4–2, for their third straight Cup victory, and tenth in the team’s history. The 1956 Stanley Cup Final NHL championship series was contested by the Montreal Canadiens and the defending champion Detroit Red Wings in the fifth Detroit-Montreal series in the 1950s. The Canadiens were making the sixth consecutive appearance in the Final series; Detroit was making their third consecutive appearance. The Canadiens would win the series 4–1. The 1953 Stanley Cup Final NHL championship series was contested by the Boston Bruins and the Montreal Canadiens. Boston was making its first appearance in the Final since the 1946 Final. The Canadiens, who were appearing in their third-straight Final series, would win the series four games to one.